Due to the population explosion in our contry and the pressures it brings on the ecology, wild-bird hunting is becoming more limited each season. On Point Guide Services of Nevada is keenly aware of this modern day problem for the upland hunter. Our main goal is giving a hunter real value by locating quality places with ample amounts of Upland Birds. We are a life-long Upland Bird Hunters, specializing in Chukars, Gambel Quail, and Hungarian Partridge. Our kennel is made up of well-trained Brittany's, Pointers, and English Setters. These dogs are masters at locating birds amongst the Nevada & Arizona rolling terrain of Cheet-grass, Cholla Cactus, & Volcanic rock. Before each season, much time is invested in locating these elusive wild birds. Hunting may take place across the entire state of Nevada and Arizona depending on bird populations and the particular species that you wish to target. Usually it is necessary to concentrate on a single species each day. Generally speaking, Northern Nevada is made up of 80% Chukars & 20% mixture of Huns & California Quail. 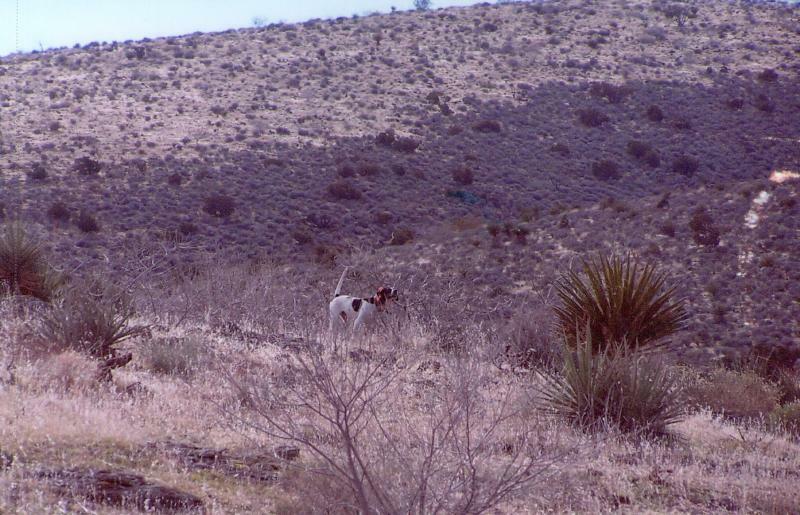 Southern Nevada is usually split between 70% Gambel Qual & 30% Chukars. Arizona hunting is for Gambel Quail, Scaled, & Mearns Quail. Make your interests known prior to the hunt so our scouting can concentrate on your choice of species. Once your targets have been determined, you will fly to Las Vegas, Reno, Elko, NV, Twin Falls, Idaho, Tucson, AZ. Programs will require some driving throughout the hunting territories. Lodging is provided in quality facilities, including three daily meals and airport transfers.